Do you know what you're having for dinner tonight? Why not head on over to Domino's Facebook page and score a FREE PIZZA! To receive a free Artisan Pizza, visit the Domino's Facebook brand page during the giveaway period and "like" their page. Then, simply click where indicated to receive a free Domino's pizza. There will be plenty of free Domino's pizza to go around, they will be giving away thousands of free pizzas! The free Domino’s pizza is the Artisan pizza (value $7.99). The free Artisan pizza offer is valid for carryout only, and it is valid at participating stores only. One free pizza per person. The Giveaway begins on April 30, 2012 at 12:00 a.m. Eastern Time and is scheduled to end on May 3, 2012 at 11:59 p.m. ET. 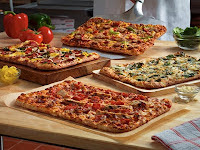 Have you tried Domino's Artisan pizzas before?